 Hey all, this is Rebecca from Rock My Bowl I make small batch granola that you may have tasted at parlez. I’m also a big foodie, and I help with some of the development of their plant-based options. I’m a big fan of seasonal eating and love to support local busin esses. I was delighted to trial a bag from Lee Greens Veg A not for profit community-led veg bag scheme that you can order online and collect from parlez. 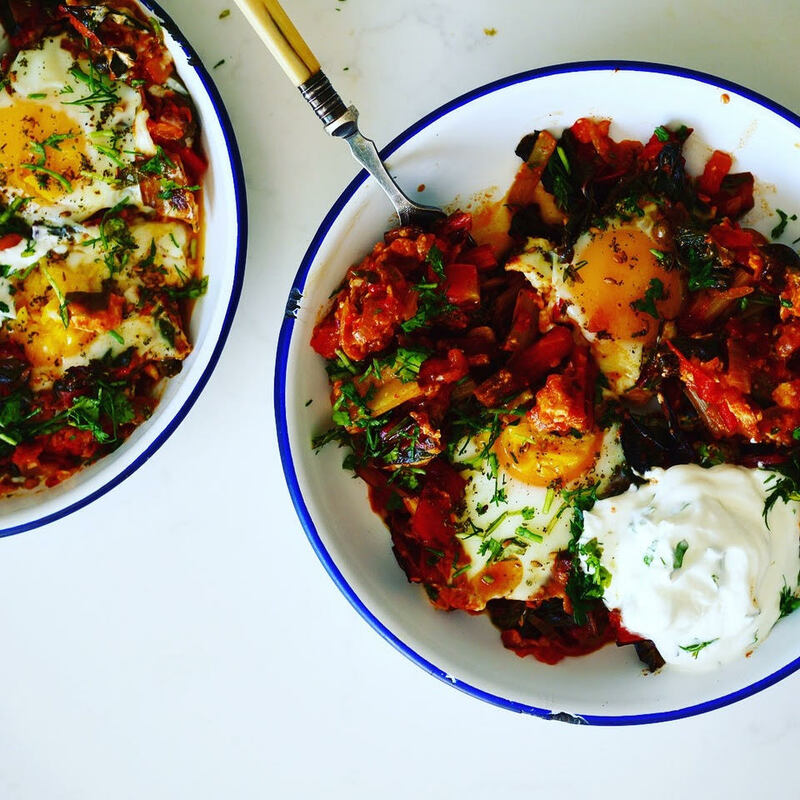 I came up with this recipe with the contents of my bag, and It’s a twist on one of my favourite dishes Shakshuka. Big bunch of Rainbow chard, chopped. (cavalo nero or kale would work too ) 3 Shallots, finely chopped. Greek yoghurt mixed with a squeeze of lemon juice. Lots of chopped herbs. Heat the oven to 160. To sauté the veggies use a casserole or skillet that can go in the oven to cook the eggs. pan well then add a tbsp of the olive oil. Let it heat and swirl around the pan. Turn the heat to medium and add the chopped shallots and the garlic. Cook them gently till the shallots start to soften and the garlic is fragrant. 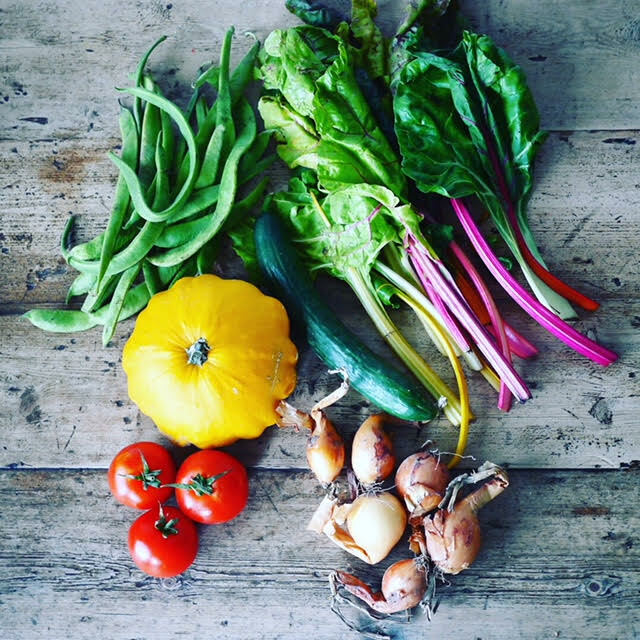 After a few minutes add the rainbow chard and let it wilt for a few minutes staring frequently. Then add the tomatoes, harissa or chilli powder if using and the paprika. Cook for 5-6 minutes and add a splash of water or olive oil to the pan if needed, the dish shouldn’t be runny but you don’t want it to stick. Make 4 wells in the mixture and gently crack an egg into each. Next you can finish the recipe one of two ways. Turn the heat down. Put a lid on the pan and cook for *5-8 minutes until the eggs look just done. Remove from heat and serve between two plates (this is my preferred method as I like my eggs very soft). Transfer to the oven and bake for *8-10 minutes and then have a peak and if the eggs look cooked as you like them remove from the oven to pile between two dishes. Season with salt and pepperServe with a generous dollop of the yoghurt and a sprinkle of chopped herbs. * Rose harissa is a key ingredient in north African cooking. A mix of chilli peppers and lot’s of other herbs and spices. The rose petals add a sweetness which softens the heat of the chilli. It’s available from most supermarkets, deli’s and food stores. * With the cooking timings please be your own guide. I often find other peoples ovens and stoves cook differently to my own. I like my eggs very soft so I would usually bake gently on the stove, The oven method will require less tending and will usually produce firmer yolks but a lovely baked texture. Please do follow me on Instagram @rockmybowl and if you try this recipe give me a tag.